Protect your metal items with the invisible protection of VCI (Vapor Corrosion Inhibitor). Ideal for any metal stored in an enclosed area. The use of VCI during shipping has been a popular form of commercial rust protection for years. This protection is now available in convenient cups for business or home use. 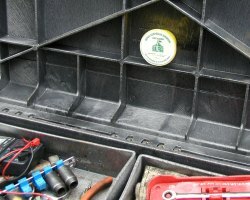 To protect your items just apply the self adhesive Rust Blocker Cups inside the space you wish to protect. The VCIs migrate from the cup to all metal surfaces within the enclosed space sealing out air and moisture that causes rust and corrosion. The Bull Frog Rust Blocker cup will protect up to 11 cubic feet of space for 1 year. The cup measures 1.25" high with a 2.5" diameter. 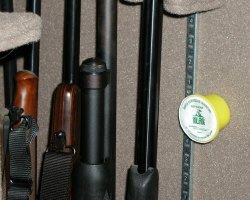 With too many uses to list, we've provided a few examples of how you could use the Rust Blocker Cup to protect your metal items. 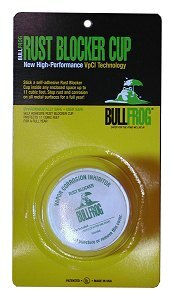 The Bull Frog Rust Blocker Cups are environmentally and user safe. The non-toxic organically derived product contains no nitrates, silicones, phosphates, heavy metals or other toxic chemicals. The product will not harm painted surfaces or plastics.